Poetry is not an easy thing, you need to find a quiet place inside you and you must plant your feet solidly on the ground, but lightly, so that your head can rise, and float away. I find that place rarely, but when I do it is a delicious treat. This is a poetry of lyrical grace that casts a spare and flickering light on human suffering. It is a poetry that maintains a surface beauty, like trees in blossom, but goes on to produce a fruit of extraordinary taste and validity. There is a gravity to both thought and language that teeters always on the brink of sorrow; it is the cry of a hurt, furred animal. Poetry here is redemption; the music of Chiara’s language, the delicate movements of the verse-rhythms, the sense of a faith under stress that emerges from the constraint of phrase and enjambement — all speaks a poetry from the heart of our times, a soul in poetry that belongs “to everyone and no one at all”. It is moving and beautiful work and beauty, as an old poet once wrote, must be “in no way cherry blossom”. The picturesque city of Pinar del Rio. This article by Paquito, él de Cuba gives more details about the transgender person that was stoned to death in a park in the provincial city of Pinar del Rio in April. The police arrested two males aged 18 and 25 who declared themselves to be a couple and the perpetrators of the crime. The victim was 41 years old, named Diosvany Muñoz Robaina. She died of internal hemorrhage in the abdomen caused by the heavy blows. The two suspects are in police custody and will be tried for homicide. All this information was supplied by the main offices of the National Revolutionary Police, apparently after talk about the case brought pressure for action. The first rumors about the stoning coincided with the Eight Cuban National Day Against Homophobia, which was held in May. Dos hombres de 25 y 18 años que declararon ser pareja fueron detenidos y están siendo procesados por el delito de homicidio, a raíz de las pedradas que en abril último causaron la muerte a Diosvany Muñoz Robaina en un parque de la ciudad de Pinar del Río. This was a few months after the opening of the wall. 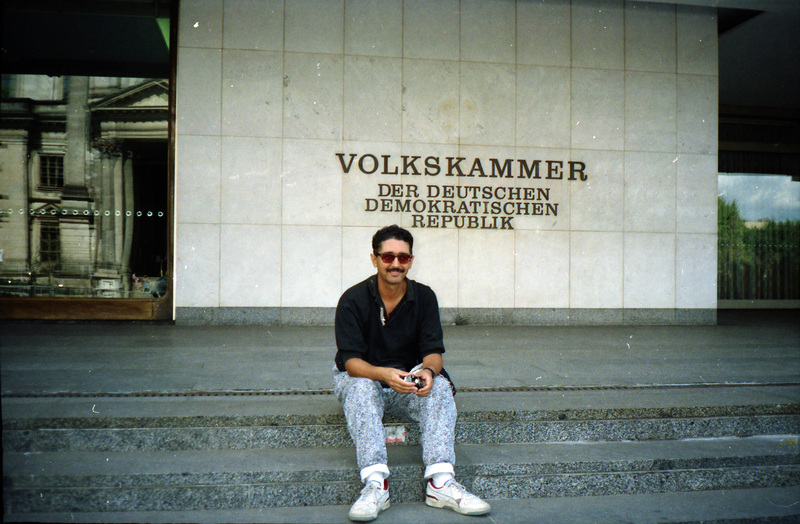 Certainly not before – I can’t imagine sitting on the steps of the East German Parliament grinning luridly in my weird 1990s jeans anytime before that. That just was not done. German? Well, I suppose so, but really an extension of the Soviet Union. And Republic? That implies sovereignty, in a place fully occupied by the Soviet Union. But Democratic least of all. Correct me if I am wrong, but it seemed self-evident that there were no democratic institutions such as councils, advisory boards or community groups (other than the Lutheran Church) that were not overtly controlled by members of the SED, the East German Communist Party. Fear was so great that the only people who dared speak at any public meeting, no matter how small or local, were those ambitious SOBs who took the opportunity to kiss the asses of the party leadership. These were the people who succeeded in East Germany, the people willing to humiliate themselves with verbally talented fealty to the party elders. It was a gerontocracy with a backward looking dynamic with little space for new ideas. Inevitably, it was the Lutheran Church, the only independent institution, that became the forum for regime-change in 1989. Right now I am putting together a visual book. It will have chapters that consist of photos, with little explanations for each picture that together will create a narrative. I haven’t done anything like this before, but have been thinking about it for a long time. Sort of a graphic novel or foto-romanzo. It will take time and a few experiments. I have just finished putting together a purely photographic book, consisting of photos of Uzbekistan with short captions after each photo. No narrative, just images. I want to see how satisfying this will be as a book. I want to feel the book, turn the pages, experience it, to see how it will work with a more complex project. The Uzbekistan book will be my next publication, and it will hopefully be the first of several that will be primarily visual. I am also a photographer and would like to be able to integrate both the literary and visual arts into one project. Wish me luck! I like to think that my settings are unique. Of course, I have not discovered anyplace new that no one has ever been to before, but my characters and their times and places are a special combination, and reflect my interest in the clash and blending of cultures. I like my novels to be full of interesting characters in unusual predicaments, so that no matter how readers feel about the story itself, they will feel that they have become introduced to a memorable character and stepped into a world that they have not been in before. My novel The Shriek and the Rattle of Trains takes place among American ex-pats in Romania and my other novel, Nickel Fare, is set in Brooklyn and Staten Island among hippies and gay people in the early 1970s. I write about it so that you don’t have to live it! Hmmm. Because I have to. I think this is true about all writers. We have to write, because it somehow completes us. It’s the scratch for our itch. And it has to be about something we believe in or else what’s the point? I love the feeling I get when writing, as though I am living vicariously through my characters. That is probably why so many writers don’t seem to mind living in isolation in a farmhouse in Connecticut or Washington State, they find the company they need in their characters. No, that doesn’t sound so great, but then again, nobody said that writers are the most socially adjusted people on earth. But besides that, there is a satisfaction about completing a story that is incomparable to any other feeling of accomplishment I have ever had. To create life and human complexity out of words is a wonderful feeling. I notice that Mark McNease says that he writes everyday at a certain time, for a set amount of time. How I admire people like that! I can only say that my own process is far more serendipitous than that. I don’t write everyday, though I would like to. Writing daily forces you to stay immersed in a literary language, and involved in the lives of your characters. I don’t do that, though. I often have to take weeks or even months off from writing when other duties and interests take over. (like right now, as I work on my Uzbeki photo project). It causes some problem for me in terms of momentum and consistency, but i like to think that there are advantages to this, as well. When I return to a piece after a long period of time, I can see it with a fresh eye, as an outsider rather than an insider. Often this helps me to work out awkwardness in the plot, or bits of dialog that are not quite clear enough. I am an ambitious reviser, and my stories go through countless re-edits and revisions before they are finished. This would be more difficult if I were involved with them daily. So, I guess that every writer has his or her own process, the one that is most suited to get the desired results. I love authors! 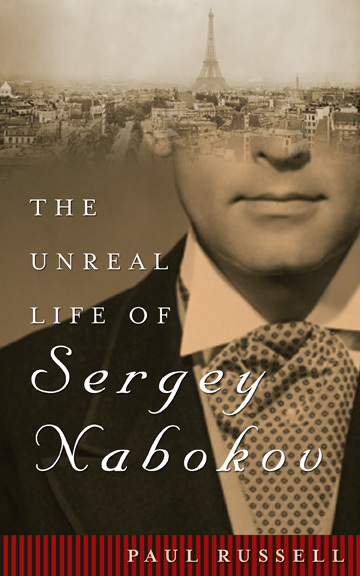 The Unreal Life of Sergey Nabokov, by Paul Russell, is a fascinating novel about Vladimir Nabokov’s brother, a man who lived a life at least as interesting as that of his more famous brother. Sergey began his life as a member of the St. Petersburg elite in Tsarist Russia, and along with Vladimir, experienced the revolution and exile at an early age. It is a familiar journey from privilege to poverty for this intellectual family, but we find in this fictionalized version of Sergey’s life, that everything takes on a different meaning when seen through his eyes. Lacking literary talents, the good looks and the privilege of heterosexuality that Vladimir enjoyed and exploited so successfully, Sergey must find his way through the dangers and addictive pleasures of Twentieth Century Europe. Everything comes with more difficulty for Sergey, and he ends up dying in a Nazi concentration camp. Vladimir, the acclaimed writer, on the other hand, becomes a wealthy writer in America, apparently oblivious to the sufferings of his brother. 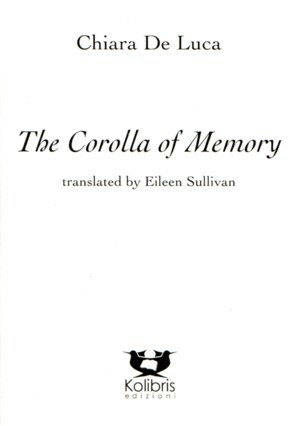 In the introduction to this novel, the author quotes Vladimir from his autobiography, Speak, Memory, when he finally breaks his silence about his gay brother, “For various reasons, I find it inordinately hard to speak about my older brother. He is a mere shadow in the background of my richest and most detailed recollections.” To be fair, it is possible that he cannot speak about his brother because of the pain of the knowledge of his troubled life and death, but to say that he is mere shadow in his mind is very telling, considering that they grew up so closely right through the tumult of revolution, until their exile as teenagers. One can perceive the easy forgetfulness that the perfect and spoiled child often feels when confronted with the plight of a less fortunate sibling. Perhaps for this reason, Paul Russell does not paint a very sympathetic portrait of Vladimir in this novel. Beautifully written, The Unreal Life of Sergey Nabokov offers an extraordinary alternative reading of the history of the Russian exile. It is a reminder, if we need one, that in this age of wider acceptance, the awareness of the lives of gay people gives us a refreshing new perspective on the world, turning the familiar on its ear, and giving depth to history. Staten Island, the least known and least populated of New York City’s five boroughs, is a puzzle to most people. Often they only know it as the destination of the Staten Island Ferry, the place where you have to turn around in the terminal to get on the return boat to Manhattan. It is a land of legendary garbage dumps (long gone), mafia deadbody dumps (less long gone), big hair, and big Ange from some reality TV show, (Staten Island being a gold mine for reality show recruiters). 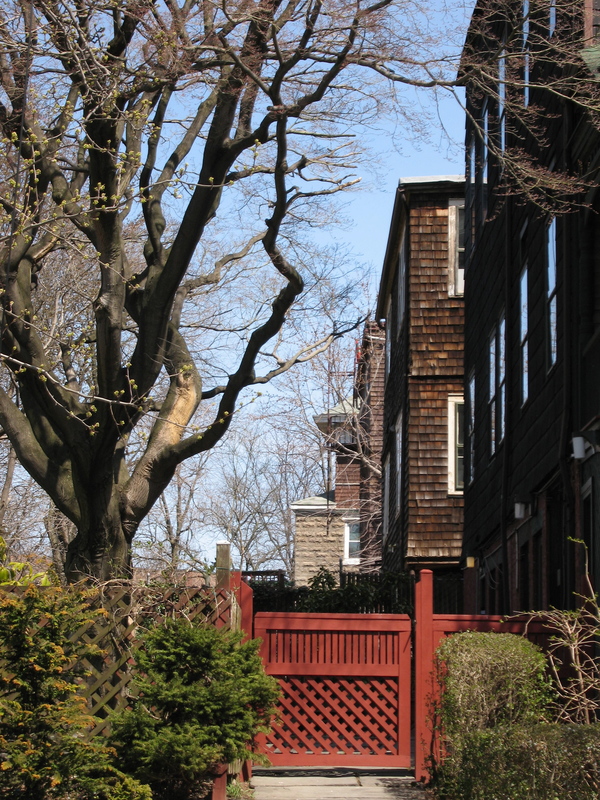 Cedar shake facades in St. George, the urban core of Staten Island. Not being a native of this island, I won’t bore you with knee-jerk defenses of its reputation. Yes, in fact, it is the land of reality TV and dumpy vacant lots. But it does have a lot of potential as a alternative urban setting in New York. The North Shore of the island is the most historic part, with a lot of areas that have remained mostly unchanged for the past 50 or 60 years. I have started writing commentary about the changes and the things that remain the same in this area, in a blog called The Rock Across the Harbor. I post information there about new developments and urban planning issues and problems that arise. There are a few new mega-projects either in the planning stage or already under construction on SI’s North Shore, in St. George there are the New York Wheel and an outlet shopping mall, and in the next community, Stapleton there is another new large scale project on the waterfront. Presumably, these projects will radically change the island’s character, and it will no longer just be a lost appendage on the coast of New Jersey, but actually become integrated into the life of New York City. Presumably. This is certainly not the first time that such changes have been promised. In the past the promises have percolated for a while then fizzle out and disappeared. Time will tell if that will happen again. In the meantime, my occasional posts are meant to document a personal perspective on those changes and those things that remain the same. Check out my blog!